Today Spick and Span window cleaners went to West Dulwich SE21 to clean the windows of a large detached double fronted period property. On the ground floor at front of property there was one large bay window and two large paned sash windows that required cleaning, at the side of the house were two small windows that were cleaned ,one belonged to the kitchen and the other to a downstairs toilet. At the rear of the property on the ground floor there was a utility room that had three casement windows that were washed as well as a glass door . There was also a glass kitchen extension that had a glazed roof and very large patio doors and window panes all of which required cleaning. On the upper level at the front there were five sash windows and at the rear of the property three sash windows and a glass panel. 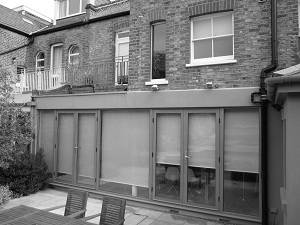 All of the window cleaning at this property in West Dulwich took place without the homeowner being present, through prior consent, and took a total of two hours to complete. Work started at the back of the property where the window cleaner used the following tools:A ladder, a carbon fibre telescopic water-fed pole, a barrel of purified water, a bucket a washer mop, a squeegee, and a scrim. The windows on the upper level at the rear of the property were the firs to be washed, they were thoroughly scrubbed with the window cleaning pole and brush, and rinsed with purified water. Then the glazed roof of the kitchen extension was cleaned. A ladder was rested on the flashing, rather than the brick work, to prevent damage to the paint work and to allow the top of the extension to be accessed for cleaning. The window cleaner used traditional methods of window cleaning and extended his reach with the use of pole. By attaching his mop and squeegee to a telescopic extension pole he was able to reach in to the corners of the roof and and as well as clean the glass, remove leaves and silt , after mopping and pulling away the dirt with a squeegee the panes were dry and dirt free. After finishing the roof the window cleaner then cleaned the large patio doors. These were cleaned without the use of ladder , but with large window cleaning tools designed for large paned floor-to-ceiling type glass. After cleaning the windows of the kitchen extension and utility room the property was made secure and locked and all tools were taken to the front of the property where work started on the front windows of the house. The Purified water method of was used for all the windows including the fan light above the front door and the glass within the front door itself. After scrubbing all the windows they were rinsed off with pure water and left to dry. All the windows of this double fronted period property with glass extension in West Dulwich were left completed clean without spots or smears.